"I REALLY REALLY enjoyed reading your incisive [newsletter] article. What a terrific analysis." - KY. Welcome to all of the new CDx3 Newsletter readers who signed up during November. This is your first issue of the CDx3 Newsletter, a free monthly newsletter devoted to the interests of CDx3 Preferred Stock investors. The "Quick Guide To Preferred Stock Investing During A Global Credit Crisis" is still available to readers of this CDx3 Newsletter. This is a new four page report that summarizes how to select, buy and sell the highest quality preferred stocks during this global credit crisis. Please download and read your free copy (PDF, download now). You'll be very glad you did. The government has found a way to take a nine page proposal and turn it into 464 pages of legislation and weeks of hearings, leaving way too many of us incredibly confused. The good news is that the component of the U.S. Treasury's Troubled Asset Relief Program (TARP) that pertains to us preferred stock investors is outside of the fray. Under this two wave program, Treasury has now designated sixteen CDx3 banks as "healthy institutions" and must be sure that The Protected Sixteen banks stay afloat if Treasury ever wants to see its billions again. I break out the program's components, clear up the confusion and name The Protected Sixteen banks in the Last Month's CDx3 Investor Results article below. The 26 CDx3 Preferred Stocks from these sixteen banks are currently providing an average annual yield of 10.9% to CDx3 Investors. Amazon.com is no rookie when it comes to putting up great deals for Christmas gifts. If books are not the number one gift item for Christmas they've got to be pretty close. In the Special Announcement article I provide the details on Amazon's Christmas promotion for my book, Preferred Stock Investing. Rather than the latest romance novel, why not give a friend or family member a truly unique book that may very well provide substantial and lasting value? Written in plain English for non-experts, Preferred Stock Investing is now on big-time sale at Amazon. The CDx3 Company Spotlight article introduces you to the ten new CDx3 banks that the U.S. Treasury added to the TARP program during November. These ten CDx3 banks, together with the six identified in last month's issue of the CDx3 Newsletter, make up The Protected Sixteen banks now in the TARP program. 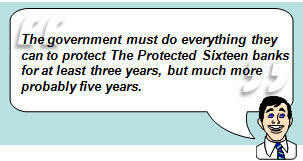 What do I mean by "protected" and how long will the U.S. Treasury convey this "protected" status on The Protected Sixteen banks? In this month's CDx3 Question Of The Month article I describe why the U.S. Treasury is incented to protect The Protected Sixteen banks for at least the next three years, but much more probably for the next five years. The Free Special Offer article below provides you with a download link to what could be the most important document you will read during this global credit crisis. 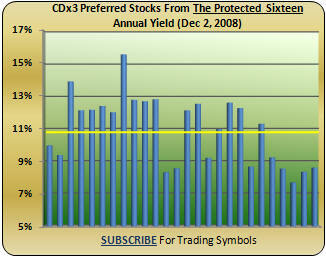 As a reader of this monthly CDx3 Newsletter, you obviously have an interest in preferred stock investing. This recently published report is titled "Quick Guide To Preferred Stock Investing During A Global Credit Crisis" and is available to my readers for free (see link in the Free Special Offer article below). Subscribers to the CDx3 Notification Service receive a report every month that identifies CDx3 Preferred Stocks that are issued by a wide variety of businesses - banks and non-banks - that are at a point in time when, research shows, their market price will tend to favor buyers. As the U.S. Treasury has rolled out its $250 billion preferred stock purchase program over the last couple of months, the average market price of CDx3 Preferred Stocks has continued to rise. Not just the ones issued by banks, but across the board - a rising tide floats all boats, at least in this case. Will the market prices of CDx3 Preferred Stocks continue to edge upward for a second consecutive month? I will report back to you in next month's issue of the CDx3 Newsletter. U.S. Treasury Finalizes Program, Designates 126 "Healthy Institutions"
The U.S. Treasury’s Troubled Asset Relief Program (TARP) is very important for preferred stock investors to understand as it has created what, in all likelihood, is the largest single preferred stock investing opportunity that we will see in our lifetimes. It’s no secret that the market prices of bank stocks (including bank preferred stocks) are at an all-time low. But which ones are safest? If you are looking to ride the recovery wave in financials, you need to understand how the TARP program has affected the market for the highest quality preferred stocks – CDx3 Preferred Stocks*. There are three components to the $700 billion TARP, one of which is critical to preferred stock investors as it is this component that is driving, and will continue to drive, the preferred stock marketplace for the next three to five years. The first component is a $350 billion set aside for the next administration (subject to change). Nothing is happening with this half of the TARP funding so, for now, ignore it. 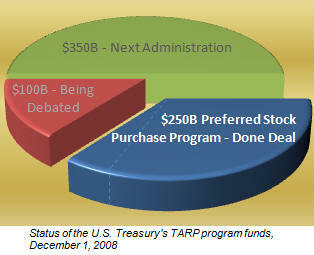 The $350 billion half that is in play has been divided into the two remaining components of TARP. $250 billion is being used for Treasury’s preferred stock purchase program (officially called the Capital Purchase Program). What About Me!? The remaining $100 billion is still up for grabs so everyone from auto makers to real estate associations to hairdressers has been vigorously waving their “What About Me” flags. Don’t let the press coverage confuse you; the debate over the remaining $100 billion does not involve the $250 billion preferred stock purchase program and is not what has created the once-in-a-lifetime opportunity for preferred stock investors. The $250 billion preferred stock purchase program is being doled out in two waves. The first wave was implemented during October then the second, and final, wave in November. In October, Treasury took the lion’s share ($200 billion) and purchased custom-made preferred stocks from nine “healthy institutions” (as Treasury has termed banks that are able to qualify for the program) with each bank receiving $25 billion in cash (Bank of America received $15 billion and Merrill Lynch, which BofA is in the process of acquiring, received $10 billion). Other banks were given until November 14 to prove to Treasury that they too were worthy of Treasury’s investment. Out of this second wave of applications, Treasury has approved 117 additional “healthy institutions” (and may approve more if there's need and cash left over). 126 Healthy Institutions: Out of 8,500 banks, Treasury has now approved a total of 126 (nine from the first wave plus 117 from the second) into their preferred stock purchase program (as of November 26, $161 billion in cash had actually been distributed to 53 banks with more on the way- see list). If the U.S. Treasury ever wants to see their billions again, the “healthy institutions” that Treasury has allowed into their program cannot be allowed to fail for the next several years. These banks are essentially now “protected” (wondering for how long? see the CDx3 Question Of The Month article below). These 126 “healthy institutions” were further subjected to the ten CDx3 Selection Criteria (Preferred Stock Investing, Chapter 1). This additional filtering eliminated three of the original nine banks from the first wave (producing “The Protected Six” mentioned in last month’s issue of the CDx3 Newsletter) and all but ten of the banks from the second wave during November. Bank of America, BB&T, Capital One, Citigroup, Citizens, Fifth Third, JPMorgan, KeyCorp, M&T, Merrill Lynch, Morgan Stanley, PNC, Regions, SunTrust, US Bancorp and Wells Fargo. Subscribers to the CDx3 Notification Service know that the CDx3 Selection Criteria have had a perfect track record throughout this credit crisis. The CDx3 Selection Criteria have successfully filtered out every financial institution that has failed during this credit crisis. CDx3 Investors knew to stay away from Washington Mutual, IndyMac, Freddie Mac, Fannie Mae, Bear Stearns, New Century and Lehman Brothers from the beginning. Those who invest in CDx3 Preferred Stocks haven’t missed a single dividend - ever. 26 CDx3 Preferred Stocks*: The Protected Sixteen have a total of 26 CDx3 Preferred Stocks* currently trading and provide an average annual yield of 10.9%. If you are looking to ride the recovery wave in financials, these 26 CDx3 Preferred Stocks* from The Protected Sixteen banks provide a historic and unique opportunity for your consideration. Treasury is still considering adding more banks to the program. I will report back to you if additional CDx3 banks are allowed behind the walls of Treasury's castle. This credit crisis has created enormous opportunity for those willing to look under the right rocks. Financial analysts, writers and expert investors have been screaming over the last few months that the time is right to jump into preferred stocks. The Three Rules of Market Price Predictability (Preferred Stock Investing, Chapter 5) explain why the market price of the highest quality preferred stocks behaves the way it does, even during this historic credit crisis. Preferred Stock Investing shows readers how to screen, buy and sell the highest quality preferred stocks. And Chapter 9 lists every qualifying preferred stock that has been issued since January 2001. Book readers are also entitled to free periodic updates. Preferred Stock Investing is written in plain English for non-experts. The book makes a great gift for any friend or family member who might be interested in learning something unique about investing. And get this: Amazon has Preferred Stock Investing on sale right now for $17.95, about $2 off of the book's regular retail price (offer subject to change at Amazon's discretion). And Preferred Stock Investing qualifies for Amazon's free shipping deal. Order now to ensure delivery by December 24, 2008. In last month's issue of the CDx3 Newsletter I spotlighted the initial six CDx3 banks selected by the U.S. Treasury for their $250 billion preferred stock purchase program. BB&T was founded in 1906 and has grown its Winston-Salem, North Carolina business to over $15 billion. Surveys shows that Capital One's "What's In Your Wallet" ad campaign has made it second only to Bank of America in brand recognition. Citizens Republic Bancorp was founded in 1871 and remains headquartered in Flint, Michigan. Fifth Third Bancorp, established in 1862, is a $5 billion bank headquartered in Cincinnati, Ohio. Headquartered in Cleveland, KeyCorp operates about 1,000 branches in 13 states and was founded in 1849. M&T Bank Corp. was founded over 150 years ago in western New York and is still headquartered in Buffalo. This $6.5 billion bank primarily serves the northeastern U.S.
PNC Financial, in the process of acquiring National City (using their TARP cash), was founded in 1922 and operates its $17 billion business from Pittsburg, Pennsylvania. Regions Financial Corp. was born out of the consolidation of three southern banks from the late 1800's. Now a $7 billion institution, Regions is headquartered in Birmingham, Alabama. SunTrust is an Atlanta, Georgia headquartered bank established in 1891. This $10 billion bank uses its 1,600 banking offices to service its southeastern U.S. customers. US Bancorp, founded in 1929, is headquartered in Minneapolis and has grown its business to be a $47 billion regional financial giant. I will report back to you if Treasury selects additional banks that meet the CDx3 Selection Criteria. How long will the U.S. Treasury "protect" these banks? - Barry B. If the U.S. Treasury wants to see their billions again, the "healthy institutions" that they allow into their $250 billion preferred stock purchase program cannot be allowed to fail (as witnessed by Treasury's separate bailout of Citigroup last month). The custom-made preferred stocks that Treasury received in return for their cash included two provisions that fix the length of time that Treasury is incented to protect their investment. Provision #1: The custom-made preferred stocks that The Protected Sixteen have sold to the U.S. Treasury have what is called a three year call date. What this means is that the banks regain the right to "call" (purchase back from Treasury) the preferred stock shares three years from now; until then, the banks must continue to pay Treasury the dirt-cheap 5% annual dividend declared on these preferred stocks. As long as the banks stay in business, Treasury will continue to receive the 5% annual return on their investment for at least the next three years. Provision #2: Once the call date arrives three years from now, the banks will have to decide whether or not they want to call (buy back) these custom-made preferred stocks from Treasury. As much as I'm sure the banks would like to get the government out of their business, the fact is that 5% money is dirt-cheap and the banks are much more likely to continue using that money for a far greater gain within their businesses. Put another way, if the Treasury's cash is costing the banks 5%, but the banks can use that money to make, say, 6.5%, why would the banks return the cash to Treasury (by calling the preferreds)? To put a cap on the length of time the banks can use their money, Treasury inserted a provision that after five years the dividend rate on these preferred stocks almost doubles, up to 9%. 3 To 5 Years: These two provisions - the three year call date and the increase in the dividend rate at five years - fixes the length of time that Treasury is going be incented to protect these banks from failure, if Treasury wants to ever see their billions again. Because of these two provisions, the government must do everything they can to protect The Protected Sixteen banks for at least three years, but much more probably five years. Now here's the really great part: The 26 CDx3 Preferred Stocks that are currently trading from The Protected Sixteen banks all carry call dates that occur sooner than five years from now. That means that, to the extent that the government protects these banks from failure, these 26 CDx3 Preferred Stocks enjoy that "protected" status for their entire remaining lifecyle. (c) fall under the “protected” umbrella of the U.S. Treasury for the remainder of their lifecycle since they have a call date that will arrive prior to that of the custom-made preferred stocks that The Protected Sixteen banks have issued to the U.S. Treasury. I really hope that you are paying attention to this. Not being familiar with your personal financial goals, resources and risk tolerance, I cannot say whether investing in any of these securities is in your best interest; only you can make that decision. But if you have been looking for a strategy to ride the recovery wave in financials, Treasury's $250 billion preferred stock purchase program has created a truly unique combination of events that I would encourage you, as a preferred stock investor, to consider. My book, Preferred Stock Investing, provides the information that you need to screen, buy and sell the highest quality preferred stocks. For those who would rather receive an automatic email message when there is a buying or selling opportunity coming up, we offer the CDx3 Notification Service. Thanks to Barry B. for the great question. You will receive a free copy of the CDx3 Special Report "Dividend Accounting." Many CDx3 Newsletter readers have been with me for quite some time. And from the email that I receive I know that many of you have read Preferred Stock Investing and have implemented the CDx3 Income Engine on your own (the book includes the resources needed to do so without the CDx3 Notification Service). The 16-month long credit crisis has shaken our financial system and everyone who is invested in it (which is just about everyone). Even though the CDx3 Selection Criteria, day after day, have successfully filtered out every failed bank for over a year now, and even though there has not been so much as a missed dividend for those who have invested in CDx3 Preferred Stocks, there's still some anxiety. I cannot only explain this market price behavior but I have the data needed to support my observations. Chapter 9 of Preferred Stock Investing includes the investment results, using the CDx3 Income Engine, for every qualifying preferred stock issued since January 2001. To thank you for your interest, and to provide you with some very timely insights, I have published a "Quick Guide To Preferred Stock Investing During A Global Credit Crisis" (PDF, download now). This is an important and timely document that all who are interested in using the highest quality preferred stocks to benefit from this credit crisis should read. Understanding the CDx3 Income Engine is more important now than ever. Coincidence Or Have CDx3 Preferred Stocks Rebounded Off Of The TARP? The CDx3 Perfect Market Index, which is available on the exclusive web site (take tour) for subscriber's to the CDx3 Notification Service, is a proprietary metric that measures the direction and magnitude of changes in the marketplace for CDx3 Preferred Stocks (more info | sample chart). A value of 100 is a theoretical "perfect market." Values less than 100 indicate a "seller's market" characterized by overall market prices that are above "par" ($25 per share). A CDx3 Perfect Market Index value that exceeds 100 indicates a "buyer's market" which is characterized by increasing dividend rates on new CDx3 Preferred Stock issues and, correspondingly, market prices below par (this is the Rule of Rate/Price Opposition, Preferred Stock Investing, page 61). Increasing dividend rates available at lower market prices - a buyer's market. The CDx3 Perfect Market Index has only indicated an overall increase in market prices five times since June 2007 with the strongest indicator coming last month, November 2008. Is the TARP program already working, sparking the long awaited recovery in financials or was this a coincidental one-time price jump?